Payton really wanted a Lego Birthday Party this year. I really wanted to do something simple and easy. I was hoping to avoid a big party. The last two years, I've planned fun birthday parties for Payton and put a lot of time and energy into them. This year, I didn't have much time or energy. So, I told Payton that if he wanted to do a birthday party with friends he could only invite a few friends. This was SOO hard for Payton because he wants to invite everyone he knows (which we've done in previous years). He's also really worried about leaving people out. Fortunately, we were able to compromise. Here was the simple and easy invitation. Payton and I made them together. 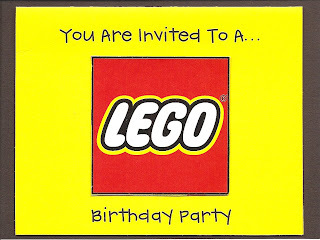 We bought a box of LEGO fruit snacks and cut out the LEGO symbol then glued them onto these simple invites. It was fun to actually let Payton help me. Here is the LEGO cake, decorations and party favors. I do not like making cakes. I've never made a cake for my children's birthday parties, but we found this LEGO cake recipe so we had to do it. I know it looks horrible, but once again, Payton got to help and he loved it, which is really all that matters, right? When the kids came to the party we had a jar full of LEGO's. They each got to guess how many LEGO's were in the jar. The child closest got to take the jar home at the end of the party. We played some LEGO games and made LEGO maracas. We did cake and ice cream and then it was time for the party to end. It was so simple, easy and fun. I really should do parties like this more often!! After Payton's little friend party, we had all of our family over to celebrate. Payton couldn't believe how many presents everyone brought. Our families are much too generous. They spoil our children rotten, which Payton loves (but his parents dread)! Payton was so excited about all his new toys! Thank you Daddy, Clint & Grandpa Ock for putting together some of his LEGO's for him! Payton had such a fun day celebrating his birthday. What a fun little party and the cake looks great! Have you seen the ones that I have made in the past!?! They aren't that great. Way creative and fun!!! Its amazing how kids love the simple things and we moms think we always have to go above and beyond-I'm learning fast. What a cute party! I love the cake! Your lego cake is awesome, very cool! How fun, I love birthday parties and yours looked like a blast! Hi, I'm Brittany! I am a story teller, editor, mother to four boys and wife to one amazing husband. Welcome to my broadcast.